Often customers follow the “safe” path with white, white and more white. A bold statement as seen here will be more striking and stand out from the crowd. This type of kitchen renovation as seen here results in a bright design representing the customer’s own personality and creativity. The bright green lifts the white to make a sensational statement, like a breath of fresh air leading into the adjoining living area. 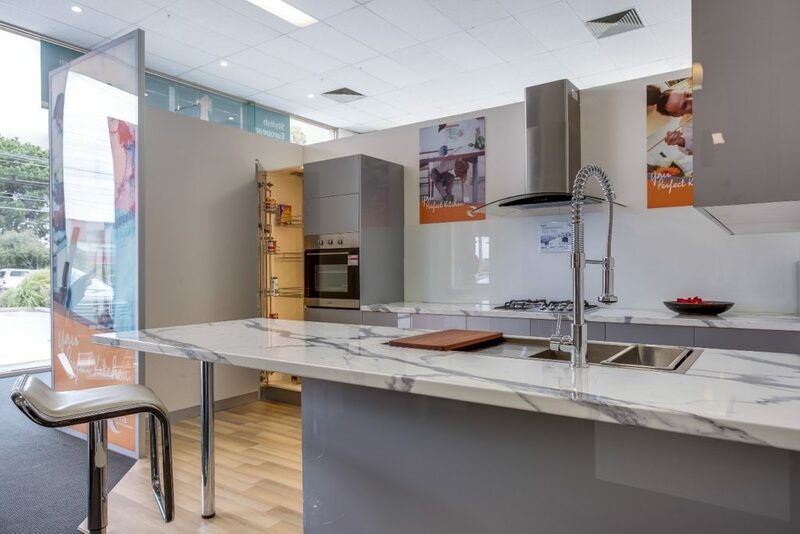 The professional kitchen design will ensure a productive kitchen space for easy reach from fridge accessibility to benchtop then stove and finally sink or dishwasher. This is the practical component but an important one to design to ensuring a productive cooking environment and ease for cooking in. 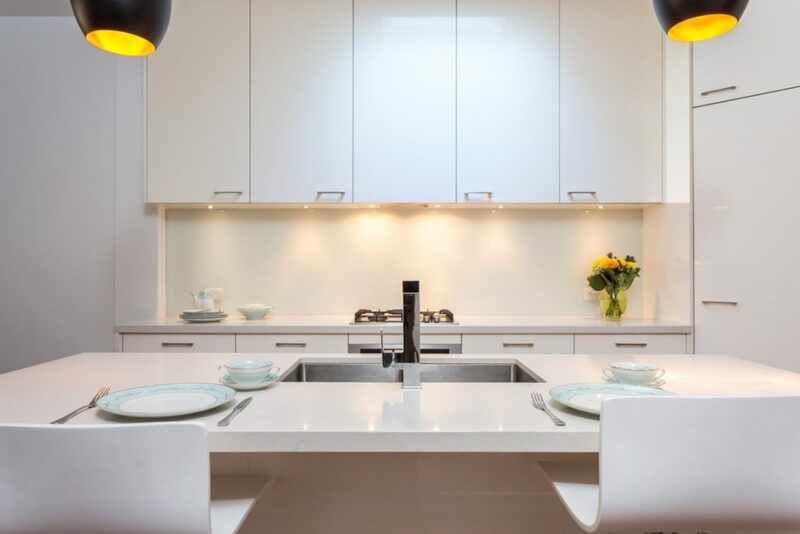 Having ample bench space is pivotal to a functional kitchen design. 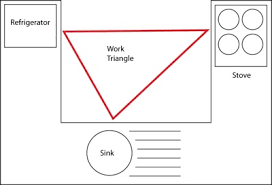 If possible, allow bench space on either side of the cooktop. Ideally, you should have at least 800mm on either side, although this may not always be possible. Having a larger area for preparation is ideal; having at least 1200mm provides a long stretch that makes it easier to prepare food. Try not to clutter your benchtop with too many items, and design a space for your microwave so that it is out of the way. So often we look at those glossy magazines and images and think that looks fantastic and the want arrives. The reality is although the kitchen might look stunning this is a long-term investment and this needs to be considered. High-quality materials will last so need to ensure you choose a company with a 10 Year Guarantee who you can rely on and should an accident happen down the track the material can be replaced under the Guarantee. Remember, looks are deceiving quality with the look is paramount. 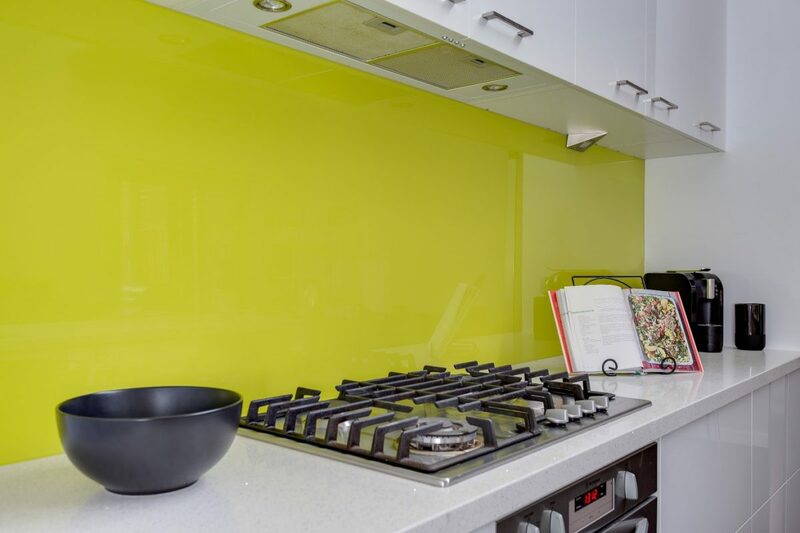 All designs will factor in the appliances and this can be an expensive part of your kitchen budget. Remember these will be used every day so important to choose carefully. Whilst a steamer oven may suit a vegetarian, a standard oven will suit other families. It is important the brand can be serviced should anything happen in the future. Extended warranties are also a good idea to protect you further down the track. Everyone wants more storage in their home and kitchens is a clear storage space so design to your needs. A clear switch is drawers instead of shelves, not only do they hold more storage they also hide any hidden mess! The ease of pot drawers, pull out pantries and clever corner cabinets are simple yet important to make your kitchen easier to use. This design component is integral to the cooking space. While you are cooking the last thing you want is the light falling behind you while you are cutting at the benchtop. 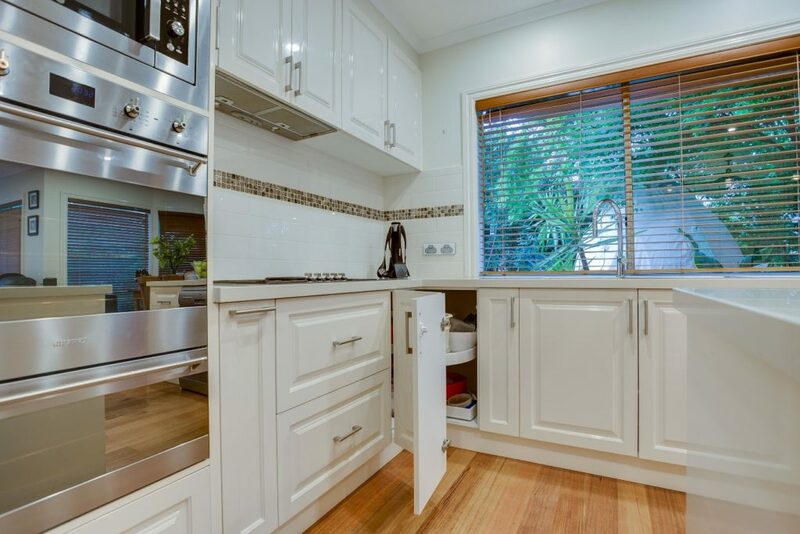 Considering underbench lighting is also effective when working on benchtops.